Whenever I write posts late at night, it's usually because I've been doing something awesome that has kept me up. Okay, oftentimes, it's really just because I've stayed up too late watching a TV show, but last night was was of those rare times when I actually had a reason to be kept awake. I went to another taping of the Harmontown podcast, which is starting to become a regular thing with my friends. It started as something I introduced to my friend Adam, and we've been to two tapings ever since we realized that Meltdown Comics (where it's taped) isn't that far of a drive and that it's only $10. Since the last one we went to, we've gotten a few more friends into the podcast, and a small group of us went last night. Harmontown is always unpredictable, since you never really know what Dan Harmon will talk about or who will end up on stage, but it's not every time that a huge celebrity drops in. Sure, there's always that hope that someone famous will make an appearance, but it's certainly not expected. That said, I was shocked when a guy in the front row started freaking out at someone backstage, Harmon said that he had told a friend to stop by, and Joel McHale ran out and did a lap around the room. As a giant "Community" fan, and a fan of McHale's comedy in general, I was elated, especially when he sat down on stage and stayed for the entire show. He was just as funny and charming live as you'd expect, and watching him play Dungeons & Dragons will likely be one of my favorite experiences ever. Harmon & co. often make jokes about how busy and famous McHale is, so I never once expected to see him there. The great thing about the Nerd Melt showroom is that the theater is tiny (I think it only seats about 100), so we got to be fairly close to him. And might I add, he was just as attractive in person as one might hope. And by "one," I mean that's what I was thinking about. Enough humble bragging ("Community" reference! ); let's talk about the outfit. Ruche sales at any time or place are dangerous, but they're especially dangerous when you realize that you live 20 minutes away from Ruche's warehouse and that the website offers warehouse pickups (so no shipping cost) and 10% off your purchase if you do. I ended up getting two dresses that I've had my eye on for a while, including this one, for less than $30. Even though I'm craving fall, I love that I can still buy summer dresses and wear them all year round. 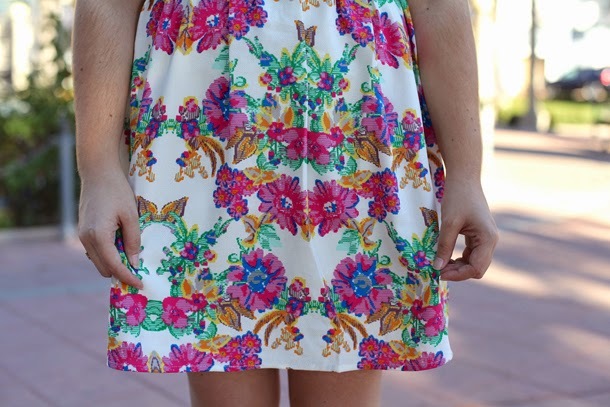 This one in particular has me swooning over the print, and the cut is just dreamy. At some point I hope to layer it over tights and boots for a fall or winter ensemble, but for now, I'm happy wearing it with a light sweater for an afternoon out with my sister-in-law and nephew. Other than random Joel McHale sightings, I spent the weekend working, breaking out my Marty McFly costume for a shift, and attending Oktoberfest with my best friends. I'm in full job hunting mode at the moment, so hopefully I'm fully employed soon, but until that happens I'm making the most of the my free time. 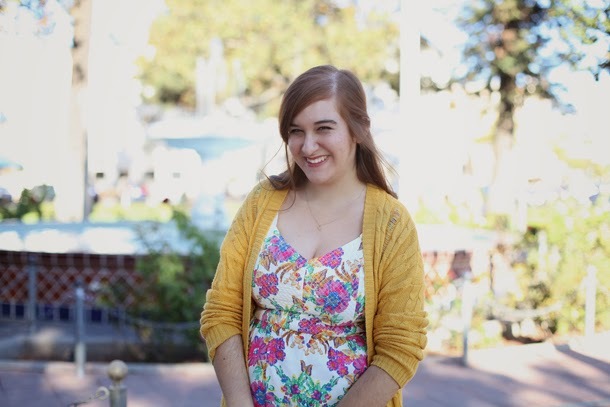 I love the floral dress for this time of year and it looks great with the mustard cardigan! 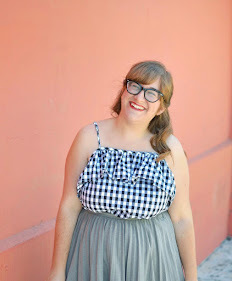 This dress is SO pretty, and it looks absolutely lovely on you <3 This brightened up my whole day! 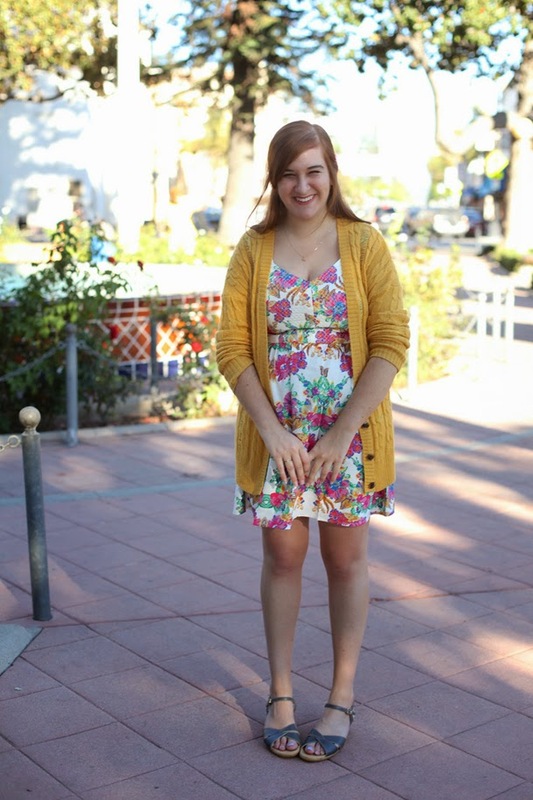 Ah, I love how bright and cheery this outfit is, from the pretty floral print to the happy yellow cardi! Love this bright and colorful dress. It's so cheerful! Sounds like you and your friends are having a blast at these podcasts! I love this dress so much and it looks great with that sweater! 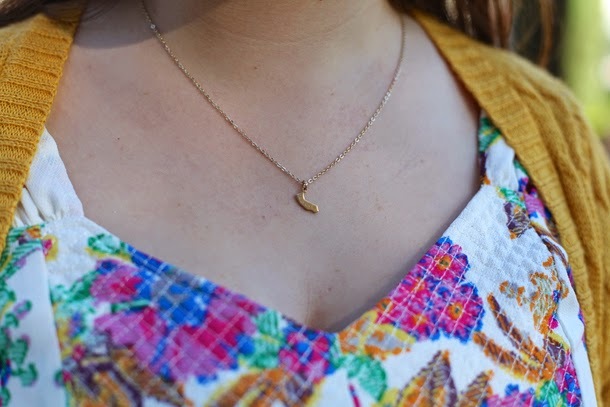 I'm with you- I love being able to wear summer dresses year round and just layer them up in fall and winter (in theory- it's still in the 90s here...). Maybe you will end up working at Ruche- seems like a perfect fit! :) I'm jealous of your comedy outings, I hear about stuff at Meltdown all the time, you are lucky to be so close. Do you listen to the comedy podcasts on Earwolf at all? This dress is so pretty! Jealous that you live near the warehouse!! 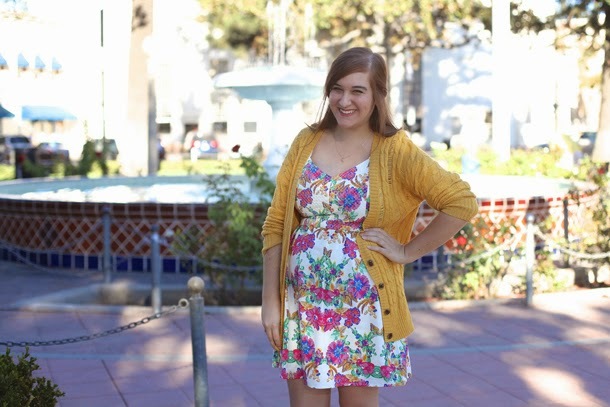 Love the mustard cardigan with the floral dress! Loved the content of your writing too. Cool. Cool cool cool.